In April the School of English welcomed Bernard O’Donoghue during his term as a visiting research fellow in the Trinity Long Room Hub. 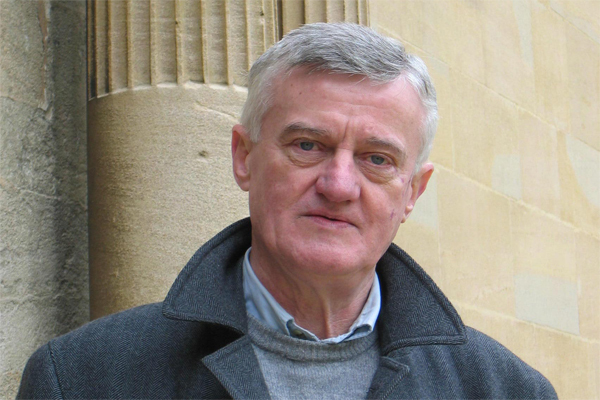 Widely acclaimed as a poet, translator, and critic, Bernard O’Donoghue is an emeritus fellow in English at Wadham College, Oxford. During his time at Trinity his research encompassed work on his two major interests – in medieval poetry, and in modern Irish poetry. He consulted the Library’s manuscript of William Langland’s fourteenth-century poem Piers Plowman (TCD MS D. 4.1), which is the most important manuscript for suggesting who Langland was. He is currently translating Piers Plowman for Faber. In addition to this project, he is preparing an edition of Seamus Heaney’s Collected Poems, also for Faber, and he spent time in the National Library of Ireland during his fellowship in Dublin, exploring the Seamus Heaney Literary Papers.